Five For Friday...Hop on Over! Well, I'll be..it is Friday. I am home and I am finally sitting and relaxing. I find that blogging can do that to you. My kids are all going to a football game while mamma rests and recuperates from a long week of teaching. Friday's seem to be my toughest classes and by the end of it all I get a bit crankers. So Doodle Bugs Teaching inspired me to stop on by and share some of the good stuff that this week did bring. My kinder kiddos worked on the sense of feel. They traced words, glued on feelies to their paper, and learned how to work in science stations! Got to love when they get so excited and they do what you ask them to. Good stuff! Our garden is at the end. It froze this week...hard. Each day, I have over 10 kids join me to harvest vegetables for home, vegetables for school, and to pull out the plants. This week, we harvested 43 pounds of potatoes for our school lunchroom. FOSS potatoes in a cup...NO WAY! We put the chittings right in the ground and imagine that...we grew big potatoes for the whole school to enjoy! Never know if the kiddos are understanding the lesson...So, this week we worked as a group to make sticky notes about air compression and what they observed! Great ideas in my makeshift syringe. I think they got it! As a mom, I have been working since May with 4 other volleyball mothers to orchestrate the volley for the cure volleyball match between the East (best side of the river!) and West High Schools in our town. Countless hours of work by all the mothers and daughters raised over $8000 dollars for the Susan G. Komen Foundation. Way to go, Wausau Volleyball! Didn't they look great in pink? Finally, I finished a fun activity for my classroom teachers to continue to have our firsties learn about amphibians. We downloaded i-nigma on our classroom Ipads. 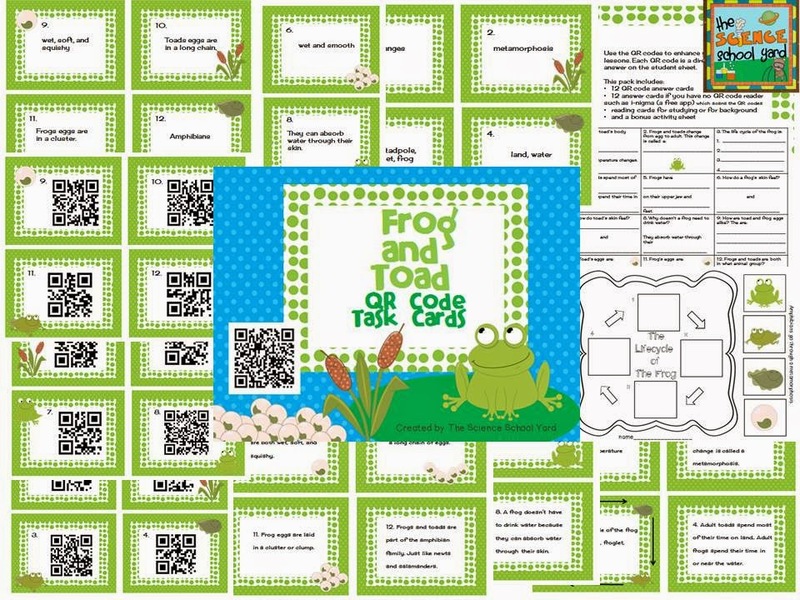 It is a free QR code reader and I showed each class how to use the Ipads to learn about frogs and toads. The kiddos are really excited to use the Ipads to "play a game"! Here is the resource I gave my teachers! The cards come with the question and answer sheet, QR code answers, reading cards, and word cards if you don't have Ipads. Hop on over and check it out! I love your garden. We started one at my school last spring and right now we have pumpkins, collard greens, and spinach growing. Those were all planted late, so we are just hoping to harvest before a hard frost. During the summer we had tomatoes and eggplant that produced quite a bit. It has been an amazing community experience! I love your garden and the frog QR code! Congrats on the amazing fund raiser!!! I am a new follower!